Kick off your visit on the 18th (Thu): enjoy some friendly competition at BowlCircus Flamingo. 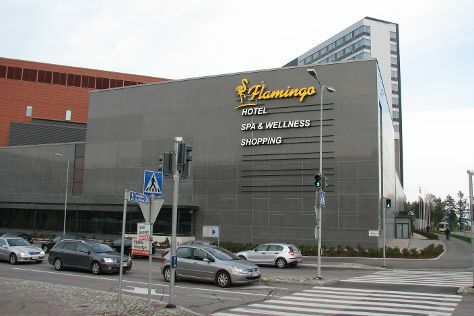 Keep things going the next day: perfect your strike at Flamingo Entertainment Center, revel in the low prices at Fazer Experience Visitor Centre, and then soothe aching muscles at Flamingo Spa. To see more things to do, photos, traveler tips, and other tourist information, refer to the Helsinki tour itinerary planner . Use the Route module to see travel options from your home to Helsinki. In April in Helsinki, expect temperatures between 9°C during the day and 0°C at night. Finish up your sightseeing early on the 20th (Sat) so you can catch the train to Vantaa. To find maps, more things to do, where to stay, and tourist information, read our Vantaa road trip planning app . Vantaa is just a short distance from Helsinki. In April, daily temperatures in Vantaa can reach 9°C, while at night they dip to 0°C. On the 23rd (Tue), you'll travel back home.